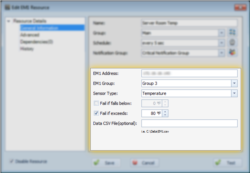 Overseer Network Monitor is capable of monitoring your data center's environmental state(temperature, humidity, wetness) using the Sensatronics EM1 monitor. The EM1 monitors are very simple-to-install network devices. Monitoring your data center is critical to the well-being of your equipment. You can easily lose thousands of dollars of hardware if your A/C unit stops working and you are unaware. Overseer Network Monitor can monitor your data center's temperature, humidity, and wetness using an EM1 monitor and appropriate probes. If your datacenter or server room becomes unfriendly to your equipment(too high or too low), Overseer will send you a notification via Email or text message. Overseer can do far more than just ping network devices. See the full Overseer monitoring capabilities page for more.